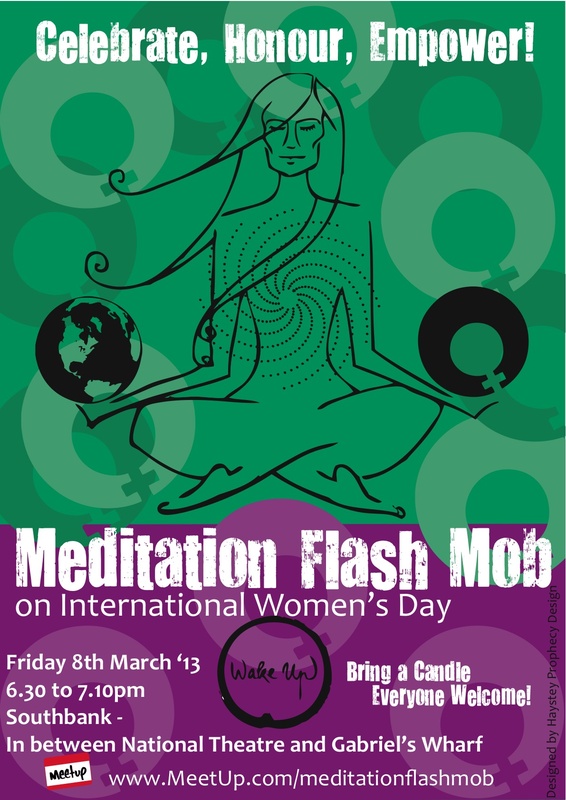 Meditation Flash Mob on International Women’s Day! March 8th is a global day celebrating the economic, political and social achievements of women’s past, present and future. It is a day that offers the opportunity for all to acknowledge all of women’s accomplishments and to re-dedicate ourselves to the empowerment of all women and girls around the world. Join us for a 1/2 hour silent sitting/meditation and hold in our hearts all the great women who have graced our lives and the world at large. May we send our compassion and love to all women who live in the despair of poverty, inequality, violence, trafficking, slavery, and abuse. May we envision a world where no woman is marginalised or abused, and where we can all live together as brothers and sisters, in peace and freedom. Bring (optional): Something comfortable to sit on. A candle. Something meaningful to you that honours an important woman/women in your life – eg, a photo. A small gift such as a flower or a handwritten poem/quote to give away to a friend or stranger at the end of the event. After the sitting, we will have a 10 minute soundbath where we chant any sounds we like, such as Om, Ah, Nah. This event is open to everyone, women and men, children, people from any religion, faith and culture. Find out more about International Women’s Day and ways to support women all year round. Join us on MeetUp for updates on future meditation flash mobs. Next PostCelebrating International Happiness Day!